Apple’s Fiscal Q4 ended on September 30th and analysts are anxiously awaiting their 4th quarter results. It was a good year for the Cupertino based company, breaking stock price records repeatedly in their last 12 months. In the spring of 2012 Apple released their newest iteration of the iPad. 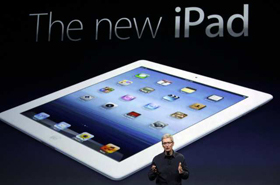 It wasn’t called iPad 3 as expected, instead Apple went with calling it “The New iPad”. This put retailers and vendors in a frenzy as the iPhone 5 approached, with companies like Best Buy opting to use signage that said “The New iPhone”. Of course, 10 days before the release of the newest iPhone, Apple confirmed it would be the iPhone 5. The New iPad, saw a significant upgrade in processor speed, display (retina) and additional wireless speed with the addition of 4G/LTE on multiple carriers. Throughout three cycles of the iPad, Apple has been able to maintain roughly the same price point, as they have with all their previous releases of iPads, iPods and iPhones. Apple is also expected to announce a 7″ version of their world famous slate as early as a press event next week. Many internet sources are reporting that Apple has ramped up production and ordered 10 million of the as yet unannounced devices. As for The New iPad (the 10″ version), Analysts are suggesting that Apple has sold around 18.38 million units. Fortune Magazine’s Phillip Elmer-DeWitt polled 61 wall street analysts and independent firms to come up with that figure. If that’s the case, Apple has sold a million more iPads than the previous quarter and 60% more than the same time last year. While the 10″ “The New iPad” has been around for six months, there’s still no slowing down the tablet machine. With the new increased size in the iPhone 5 many people are curious to see how many 7″ iPads can be sold. The “iPad Mini” is expected to be the “must have” gift this holiday season.